Swarthmore’s regional alumni organizations are called “Connections.” Connection events range from a guided tour to a museum to a family picnic in the park. The Alumni Office seeks volunteers to help organize and staff Connection events. For more information, contact Geoff Semenuk at gsemenu1@swarthmore.edu at (610) 328-8453. Did you graduate in a year that ends in ’05 or ’10, or in 2008? If you want to make Alumni Weekend 2010 the best ever, volunteer to serve on your class reunion planning committee, planning and coordinating class activities, and—most important—encouraging classmates to attend on June 4-6, 2010. If you are interested in helping, contact Astrid Devaney at adevane1@swarthmore.edu or (610) 328-8412. The Alumni Council, the governing body of the Alumni Association, supports students, alumni, and the College. If you are interested in serving on the Council, or would like to nominate a fellow graduate, contact Lisa Lee, director of alumni relations, at llee2@swarthmore.edu or (610) 328-8403. The Swarthmore Extern Program, held during the last week of winter break, is a five-day job-shadowing program that enables current students to explore career fields of interest. Alumni may volunteer to invite students to their workplaces to learn about their careers, host student externs in their homes, or both. The upcoming extern week is January 11–15, 2010. For more information, contact Laura Sibson at extern@swarthmore.edu or (610) 328-8352. Alumni Admissions Volunteers are a vital part of the Admissions Office’s outreach, recruitment, and yield efforts. Volunteers interview prospective students, represent Swarthmore at college fairs, and serve as resources for prospective and admitted students and their families. 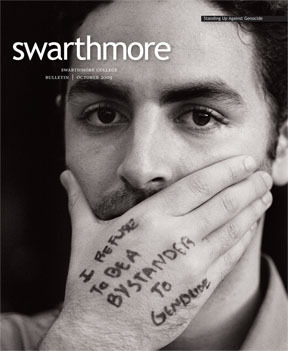 For more information, contact Christine Costello ’07 at ccostel1@swarthmore.edu or (610) 328-8307.